Walkers and Hikers have been classifying UK mountains ever since Sir Hugh Munro first created his list of 'Munros' in 1871 - usually with the intention of climbing to the top (or 'bagging') them all. 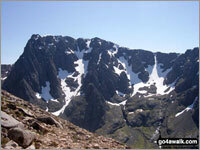 The Mountains in Scotland - The Munros, The Corbetts and The Grahams. Peak Bagging in any of these mountain groups will keep most people busy for decades to come - so all you have to do is pick one and start 'peak bagging' for yourself. For a collection of incredibly useful Peak Bagging Maps and Tick Lists detailing all the Mountains, Peaks, Tops and Hills by geographical area - click here. For some tips and advice on how to get your peak bagging career started - click here. But why bother ticking off mountains tops as you walk them? Working your way through a list of English, Scottish or Welsh Mountains gives added purpose to your walking. It offers measurable results (peaks & mountains 'bagged') while suggesting new places to walk and explore that you may not have otherwise considered (peaks & mountains yet to be 'bagged'). 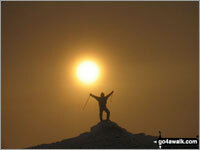 In any event if it gets you out and into the hills - then that is reward in itself. OK, count me in - how do I start recording & saving My Personal Peak Bagging Record (MPBR)? LOG ON and select your first mountain from any of our detailed Mountain Information Pages (such as The Wainwrights, The Mountains in England, The Nuttalls in England, The Deweys in England, The Mountains in Wales, The Nuttalls in Wales, The Munros in Scotland, The Murdos/Munro Tops in Scotland, The Corbetts in Scotland, The Grahams in Scotland, The Donalds in Scotland, our A to Z or Search). The Mountains, Peaks, Tops and Hills you have already bagged have a green circle with a white tick and the date underneath - the ones you have yet to climb have a red circle with 'not yet' written in it. To change the mountain status from not bagged to bagged (or to change the date or details) simply click on the icon & follow the on-screen instructions. You can record which Mountains, Peaks, Tops and Hills you have climbed, when you bagged them, who you went with, the route taken, what the weather/conditions were like and any other comments you might want to make to remind you of your fantastic day in the hills. You can also access your MPBR via go4awalk Mobile. This means you can quickly & easily record, edit and view your peak bagging achievements whether you are at home/work on your desktop computer or in the pub/at the top of a mountain with your iPhone, HTC Android or Blackberry Smart Phone. You can also download your MPBR as a .csv file and import/save with your favourite spreadsheet software (like Excel or NeoOffice) to keep a copy of Your Personal Peak Bagging Record as an off-line back-up. How can I view my progress? Important: Since some of the Wainwrights in The Lake District are also classified as English Mountains (Hewitts) (eg Scafell Pike, Helvellyn, Skiddaw . . .) your English Mountain (Hewitt) Bagging Record will automatically be updated as well so you do not have to enter any information twice or three times. How about viewing My Peak Bagging Progress in smaller chunks or areas? No problem. If the thought of walking and climbing hundreds of Mountains & Hills seems a bit daunting, you can tackle, record and review your Personal Peak Bagging Record Progress in smaller chunks. What about seeing just the Mountains, Peaks, Tops & Hills I have bagged to date?
. . . and even download it as a .csv file so you can open it and save it on your computer using regular spreadsheet software such as Excel or NeoOffice. Not only that but to make it all even easier . . . 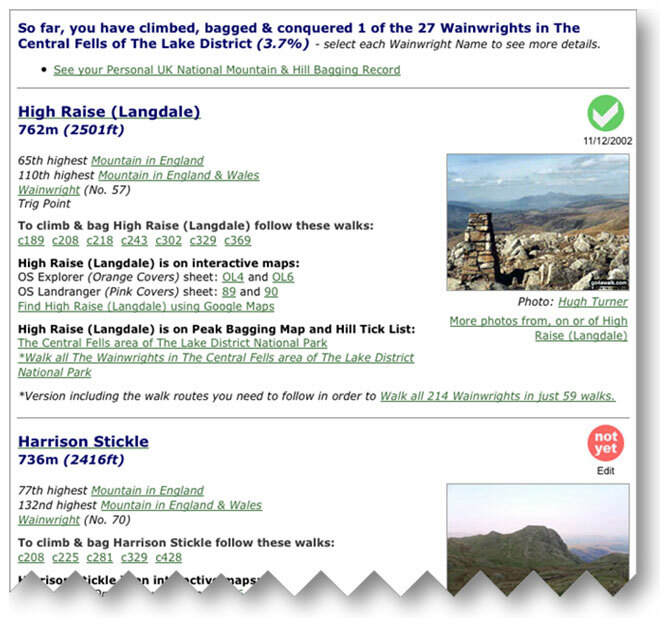 It does not matter which go4awalk.com page you are on when you record your Mountain, Peak, Top of Hill as officially 'bagged' - your browser will automatically return to the page you were on without having to trawl your way through lots of menus and links. Can I view my Personal Peak Bagging Record on my iPhone, iPod Touch, HTC Android, Palm or Blackberry? Your Personal Peak Bagging Record is also available on the Mobile version of go4awalk.com so you can view, edit and record your Peak Bagging Exploits anywhere you have access to the internet whether your are at work of at home on a desktop computer or in the pub chatting with your friends/at the top of a mountain using your smart phone. To activate Your Personal Peak Bagging Record uses just 1 credit. Once activated, you can view, edit, add to and download Your Personal Peak Bagging Record as often as you like for FREE providing your account remains in credit. For more details about go4awalk.com Accounts and what they can be used for see How it works / The Benefits of being an Account Holder. 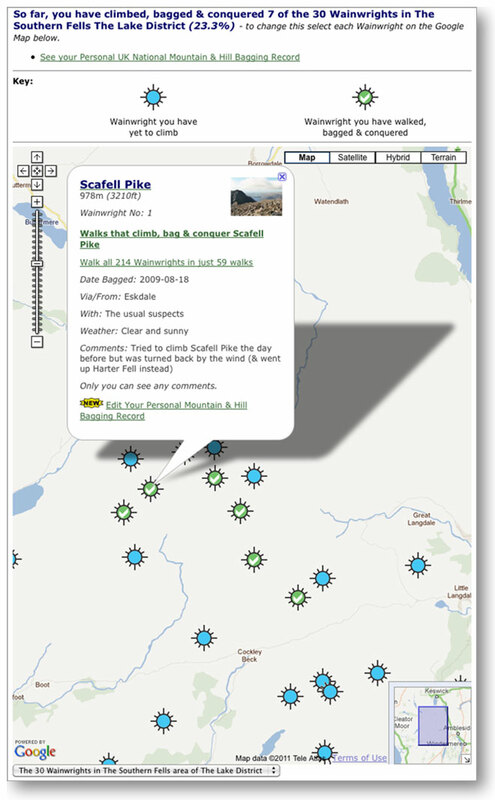 Which Mountain and Hill Lists and Interactive Maps can I access? All the popular Peak Bagging Lists are available now. Other Mountains, Peak, Top and Hill lists such as Bridgets, Corbett Tops, Graham Tops and Marilyns are planned along with lists and google maps of all sorts of useful Mountain, Peak, Top and Hill Classifications like UK County High Points and The Lakeland 100. Fantastic. How do I get My Personal Peak Bagging Record started? Simply LOG ON and choose your first Mountain, Peak, Top or Hill or enter the name of the mountain or hill in Search and follow the on-screen links to start recording your progress. What your fellow Peak Baggers think . . . The views expressed by contributors to this discussion are not necessarily those held by go4awalk.com.